85 percent of European households had an internet connection in 2016. 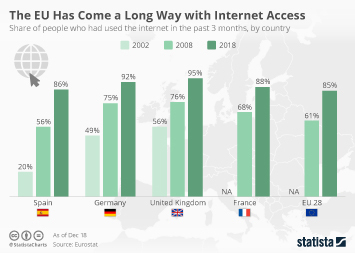 The share of households with internet access in the European Union (28 countries) grew by 30 percent compared to the share of connected households in 2007. An estimated 189.8 million people had a broadband internet connection in Europe in 2016. Internet user penetration in the United Kingdom is forecast to reach approximately 95 percent in 2021. Forecasts for France and Germany predict a penetration of 81.32 and 82.62 percent, respectively. Mobile internet penetration in the UK amounted to 70.17 percent, 63.41 percent in Germany, and 66.14 percent in France in 2015. Roughly 56 percent of individuals in the EU-28 use a mobile phone to go online. YouTube accounted for almost 20 percent of mobile traffic in Europe as of July 2015. The internet was used daily by 71 percent of individuals in the EU in 2016. In the same year, nearly half of individuals in the EU-28 used the internet for online banking. Over 50 percent of Europeans in all age groups used mobile banking in 2016. It was more common among younger users with, namely among approximately two thirds of all online consumers between the ages of 18 to 34, while the share of users among the oldest age group of 55 to 64-year-olds was at 52 percent. Other uses of the internet included sending and receiving emails, which was done by 71 percent of all individuals in the EU-28. An examination of internet usage would not be complete without a closer look at social media usage. Active social media penetration in European countries in January 2017 shows that figures were highest in the Nordic countries, and in smaller countries like Iceland and Malta. Bigger markets and countries in Eastern Europe had, in general, lower penetration rates. Active mobile social media penetration in European countries was somewhat lower, but overall trends were comparable. However, in terms of overall users, Russia led the comparison with 38.5 million monthly active mobile social media users in January 2017. More interesting topics from the industry "Use"